Best Pool Alarms for your Home; What Are They? Good Housekeeping recently did an evaluation of the best pool alarms. There are two basic types. One is a home alarm that attaches to the gate or door leading to the water. The other lets you know when the water is disturbed. Good Housekeeping researchers recommend using both to ensure adequate protection. Drowning is currently the second leading cause of accidental death among kids 14 and under. So the more protection you have, the better. In some states, protection is required. One of the big concerns is that kids can bypass the system. This has happened with simpler models. One of the more technologically advanced models sits below the surface of the water. A key is needed to enter "swim mode". Unless the kids can find the key, they cannot get past this type. When you are comparing the systems available, one of the things you might look for is the wind test. While it is a kind of motion detector, the alarms should not be triggered by high winds. The models that sit on the surface of the water are less resistant to wind. They are triggered by wave action. Some brands automatically rearm the system when the water has calmed after a swim. This is a helpful feature. Forgetting to set the alarms is common. A pool door alarm works the same as a basic burglar alarm. When the electric circuit is broken by opening the gate, a siren sounds. The electric circuit is usually referred to as the sensor. There are several different models on the market. The features may include sirens at both the gate and inside of the home. It is important to note that these systems are only useful if there is someone inside of the house at the time. Another type includes a lock with a four-digit pass code. In order to open the gate, the code must be entered correctly. This would prevent a neighbor or trespasser from entering the yard (at least through the gate) while you were away from home. The drawback of any pool door alarm is simple. It is often possible to climb over the gate or fence and enter the water. This is one of the reasons that GH researchers suggested that both layers of protection be used; the motion detector and the gate alarm. The prices of the models tested by Good Housekeeping ranged from $30 to $700. 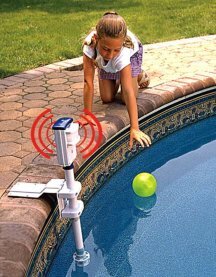 The best pool alarms of the motion detecting type, according to GH, cost as little as $260, definitely a worthwhile investment.